I recently found the need to have one of Techerator’s email accounts automatically forward emails to multiple recipients for notifications. Gmail has built-in email forwarding (to a single email address), but there is a very simple trick to forward to multiple addresses. 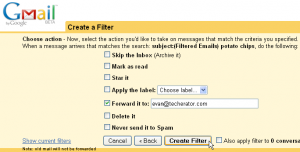 In Gmail, click the ‘Create a filter’ link at the top, near the search box. You can now create a filter to only forward select messages, or if you want to forward all messages you can enter the current account’s email address in the ‘To:’ field (in this example, it would be tips@techerator.com). Click ‘Next Step’. In the next screen, check the Forward it to: box and enter one of the desired email addresses in the box. Don’t worry, we’ll add the other addresses in the next step. Click Create Filter. Repeat this process for any additional email addresses you want to forward messages to. Be sure to keep your filter settings the same to avoid any incongruities.